When the Ferrari 488 Spider rolled off the production lines, it captured international acclaim for its stylish design and powerful engine. 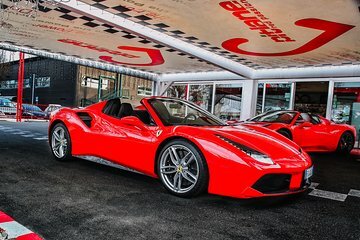 On this road test drive experience, take the wheel of a 488 Spider with your professional instructor and see what makes Ferrari sports cars so special. With fuel and insurance included, spin along the Maranello roads where Enzo Ferrari's dream took shape and feel the force of the car’s powerful acceleration. With carbon fibre frame and racing seats, enjoy an authentic race-driver experience.